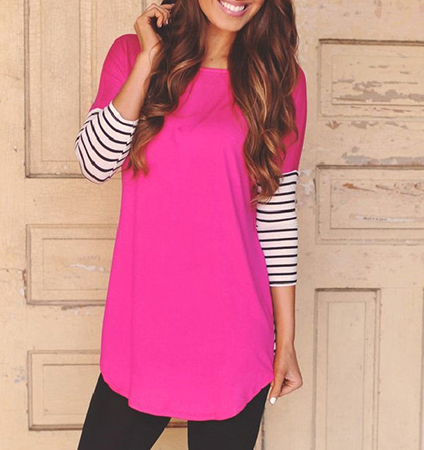 This is an eye-catching women’s tunic top that you will love. The long, slender style of this top works to elongate the figure and present a more slender look. It has a round neckline and three quarter length sleeves. The tunis is presented in your choice of fuchsia or black with striped sleeves that are three quarter length. This blouse was designed to fit easily over the head and has no buttons or zippers. It is made from a beautiful, high quality crepe fabric. We are offering this garment available for purchase in sizes Small, Medium, Large and Extra Large.